As advertisers tighten their belts in a down economy, business is exploding in performance media. J.P. Morgan suggested that 2009 “performance-driven advertising [will] continue to rise.” Ad markets are flooded with more media to buy. This happens daily. With every new ad based revenue company this will only get worse. Publishers who dug into the trenches of CPM, are now willingly to openly consider performance pricing models. Well guess What? Learn from this. You know what is going to happen? A lot more media on the supply side will be appearing soon. The ad buying markets will be flooded with ad opportunities, Billions upon Billions of them per day. From social media platforms to text platforms and so on. This will force analytics, and the quality of the ad performance as it relates to the Ad Buyer’s goals to become much more relevant over time. And USER Intent must be understood. The likes of Google must perform better semantic reduction for User Intent! User intent leads to better models of the semantics of intent. Those that innovate in this area will be very successful as that is where Ad dollars will flow. With so many companies using Ad Revenue models how could it flow anywhere else? Didn’t we already learn a parallel lesson? In recession, online advertising fell by 27 percent, but then we watched search advertising evolve because it was performance-driven functioned off of CPC. Keyword costs went ridiculously high , however, inventory will always be limited by the volume of search queries. Will search queries out proportion increasing funds to spend on advertising? There Are Many Facets of Performance Media. Performance media is more complex than most people realize. Therefore, defining performance media in a singular way isn’t really appropriate. Performance for a brand entity might just mean controlling the total cost of driving traffic to a site in predictable way, i.e., via CPC. An e-commerce entity looks to pay only upon a sale — in other words, cost per action (CPA). Lead generation, also known as cost per lead (CPL), can be used for many purposes, including initiating a direct sales contact, feeding a database for ongoing re-marketing, or building community. Lead gen has broader appeal because it could apply to brand marketers as well as direct marketers, to products or services, to B2C (define) or B2B (define). Performance advertising is properly suited to any advertiser — it’s a matter of sourcing items that appropriately match your needs. Because performance media is complex, take some time to learn the ins and outs if you aren’t familiar with the space. Performance media has a shaky reputation for a reason: some players don’t abide by any rules or broker their offer through unscrupulous affiliates. Avoid no-name CPA networks. Ask for transparency. 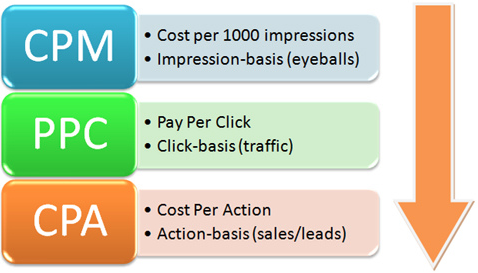 Understand how many times your lead is being sold to other advertisers simultaneously. Do the Math and Establish Benchmark Metrics, they will only keep building more. You must stay on top of this or you will fall rapidly behind. Too far to catch up. If you’re going to enter the world of performance advertising, divine purchasing thresholds. How you derive those numbers is equally important. This means that the advertiser has to take a closer look at the whole equation, perhaps back calculating from an actual sale, to figure out what it can afford per lead or per click. This may sound easier than it is, particularly for advertisers who have never gone through this process or aren’t intimately familiar with the variables of their sales or action equation. I’ve had advertisers give me a CPA or CPL target and when I ask how they derived it, they’d say, “Well, that sounds like a good number.” That’s not a good reason. Understand your entire conversion process and how many visitors turn into leads, leads turn into sales, how many times you need to call or e-mail a contact before a buy, the value of that sale, and if there’s recurring value to that customer, among other factors. Watch your funnels and tracts of conversion. Follow your analytics, what page do they leave on? This process will never end. It is iterative and will be a full time job. Just because you might only pay on an action doesn’t mean you want to skimp on the creative process. Creative might be even more important. In a CPA environment, if your creative don’t convert, the publisher displaying your ad will replace it with another ad. Plan for performance and you’ll have performance in your plan!